The Minnesota Lynx have nailed down a playoff spot with 13 games left on the regular-season schedule. But even at 19-2, the work is not done. 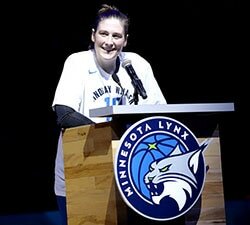 Minnesota could well become the first 30-win team in WNBA history. And yet, what makes the Lynx great is that kind of success is a by-product of what they do, not the end game. Sylvia Fowles, who has been the Western Conference Player of the month for three straight months on the march to an MVP award, first attributes her own success to her teammates. “It’s their unselfishness, making sure I’m put in the right spot to score,” Fowles said. Whether the Lynx players decide to take advantage of the opportunity to rest during this stretch run, or push hard to the finish in preparation for the playoffs, they are good to go. A thumb injury to Elena Delle Donne is going to require surgery and keep her out for at least two weeks, and it will definitely hurt Washington’s quest to earn one of the league’s top two playoff spots. But the Mystics have been fighting through injuries and absences all season. Emma Meesseman was out while playing overseas. Tayler Hill was having a breakout season before she was lost for the year with an injury. Natasha Cloud is currently out of the lineup and Delle Donne had already missed games with an ankle injury, which forced her to miss the All-Star Game in July. A season that was supposed to be a tide-turner for this perpetually marginal WNBA franchise hasn’t gone quite the way anyone had hoped. But there’s little doubt that the Mystics have the pieces to be one of the league’s elite teams, if they can just keep them on the floor. It hasn’t been an easy season in San Antonio. The struggles, the injuries, the roller-coaster start for No. 1 draft pick Kelsey Plum. But good things aligned for the Stars against the New York Liberty on Tuesday, resulting in a 93-81 win that might be a springboard to a better finish. Kayla McBride has been in and out of the lineup this season due to injury, but there’s little doubt of her impact when she is on the floor. McBride put up a career-high 31 points in Tuesday’s win. She was 9-for-22 from the field with five 3-pointers. Kayla Alexander, in her first start of the season at center, finished with 19 points. And Plum is finding her way. The rookie has scored in double figures in seven of her last 10 games, including 10 points in the Liberty win. The Stars play three of their next four games at home, a chance to build some momentum heading into the final weeks of the season. Layshia Clarendon is fine if you want to call this her breakout season. 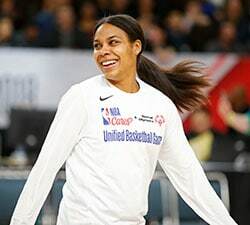 Clarendon, in her fifth season in the WNBA and her second in the backcourt for Atlanta after coming over in 2016 in a trade from Indiana, is establishing herself as one of the league’s best young point guards. Coming off her first All-Star Game appearance, Clarendon ranks second in the league at 7.2 assists per game. She is averaging a career-best 11.7 points per game and shooting better than 90 percent from the free-throw line. 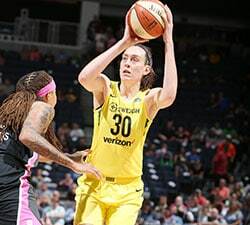 In her first game following her first All-Star appearance, Clarendon narrowly missed a triple-double with 15 points, nine assists and 10 rebounds against the Mercury. As the Dream play without franchise player Angel McCoughtry this season, Clarendon has played a big role in picking up the slack. The former Cal standout is also benefiting from a strong, young backcourt that includes Tiffany Hayes and Rookie of the Year candidate Brittney Sykes. The Dream are hanging in playoff contention, currently sitting in the No. 8 spot in the league standings at 10-13. 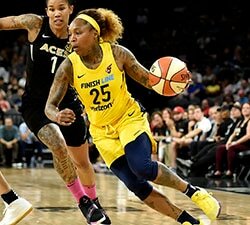 Atlanta bolstered its frontcourt depth this week in a trade by acquiring veteran forward Tamera Young and young post Imani Boyette from Chicago. Clarendon, meanwhile, will continue to focus on the “little things” that have improved her game in a big way. Clarendon said she is preaching mental toughness to her teammates. Longtime WNBA reporter Michelle Smith will have a weekly column on WNBA.com throughout the 2017 season. The views on this page do not necessarily reflect the views of the WNBA or its clubs.